If you haven’t pruned your roses yet, it’s not the end of the world. They’ll be just fine if they’re not pruned exactly on President’s Day. (Trust me on this; I generally miss this date each year.) So, on the next nice day, put it on your list of to-dos. 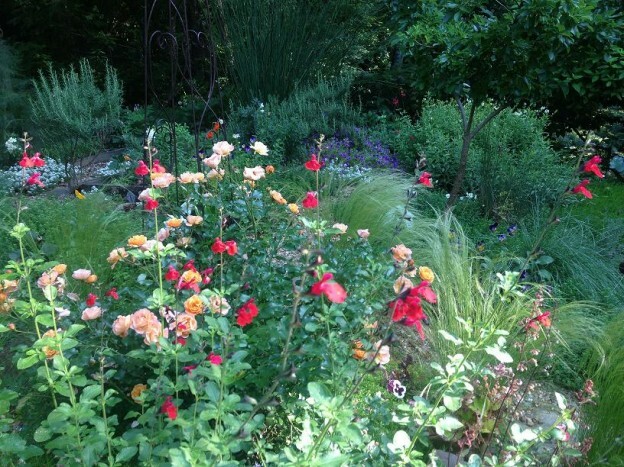 My plan each spring is to clean out any old mulch in the perennial/annual beds that my roses are in before pruning. When I’m done pruning and cleaning out the beds, I’ll remulch everything. This helps cut down on any old, diseased material in the garden. Preventing disease problems by providing better air circulation through your shrub or climbing rose is the primary reason for pruning them, along with encouraging new growth and better flowering. When you’re finished, your roses should also generally be more open and a better shape than when you started. Always use clean, sharp pruners and, if the canes are large, loppers and wear long sleeves and gauntlet gloves. It’s good pruning practice to also wipe the cutting surface of your pruners with either rubbing alcohol or a 10% bleach solution to avoid the spread of disease. Begin by taking a look at the rose. Do you see gray, dead canes? Cut those out first. 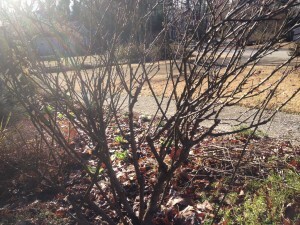 Depending on the winter, there may be quite a few dead canes or there might not be many at all. This is always the first place to start with any pruning task. 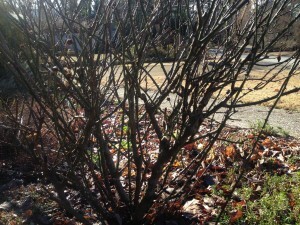 Take a look at the base of the shrub. 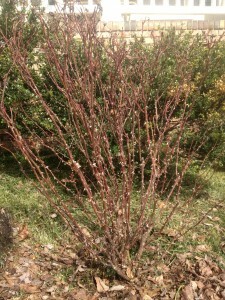 Do you see “suckers” – green shoots coming straight up from the very base of the shrub? Cut those out next. Okay, you’ve removed dead branches and suckers. Next, cut out any weak or twiggy branches thinner than a pencil. What you’re trying to do is thin out the entire shrub, improving air circulation which should help in reducing common disease problems. Step back and take another look. The shrub should be looking a bit smaller. Now select 4-6 of the remaining canes and cut them back to a height of 1′-4′. Look closely at the stems before you cut and you’ll see buds. Make your cut at a 45 degree angle, just above (about 1/4″) an outward facing bud. This is important to remember because, once again, the goal is to create outward growth for better air circulation through the plant. It’s all about preventing disease problems. What you’re left with when you’re done should be a well shaped, open shrub. Rosarians also say that climbing roses need minimal pruning at this time of year. So, if you have any climbing roses, prune to remove dead or winter damaged canes; then prune them lightly after their initial spring bloom to control their size. 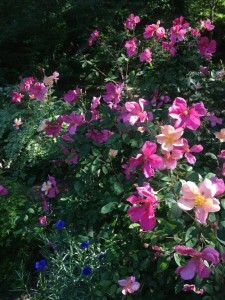 Many of you have the antique shrub roses such as Rosea chinensis ‘Mutabilis’ Butterfly Rose. 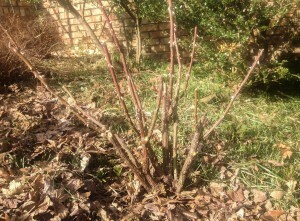 These old fashioned roses need a light trimming; prune about 1/3 of the growth in the spring and then lightly groom them throughout the growing season. For all of you who have the ubiquitous ‘Knockout’ roses, they are incredibly vigorous growers. 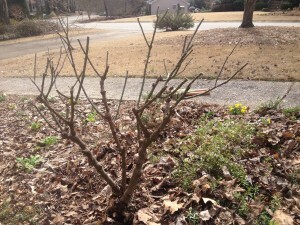 They can easily be cut back by half or more after doing the usual pruning out of dead canes and twiggy growth. The pictures here show a yellow ‘Knockout’ rose that I really need to move out of this bed; but, since it seems to still be here (Life got in the way of moving it too. ), I have decided to cut it back quite severely. I bet by the end of summer it will still be enormous! (As a side note, I clearly remember, when the ‘Knockout’ series of roses came out, the height given at maturity was 3 feet. How wrong that was!) Here you see the before and after pictures. This yellow Knockout rose will grow to tremendous proportions in a season! Now that the roses are pruned, I will mix up some Haven Moo Poo Tea (We’ve just started carrying it.) for a good organic boost. Then the fresh layer of shredded bark mulch is added to finish the beds. Another excellent link on pruning roses can be found in this article from the Jefferson County Extension Service. See it HERE. This is one of those garden tasks that takes a bit of time but, in the end, is well worth the effort! 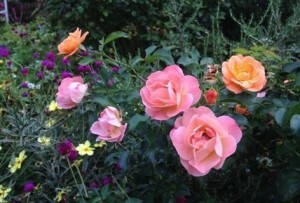 This entry was posted in Roses and tagged butterfly rose, flower carpet rose, knockout rose, pruning, roses on March 1, 2016 by Kris Blevons.